In March, we brought the inspiring story of Oak Creek, WI's unity in the aftermath of a hate crime to three Midwestern cities. We returned to Oak Creek, WI to premiere our 30-minute documentary, Waking in Oak Creek, on March 13; traveled on March 25 to Bloomington-Normal, IL, a city that first sparked Not In Our Town activities in their community 18 years ago; and finally to executive producer Patrice O’Neill’s hometown of St. Louis, MO on March 27 for a screening and discussion. The response has been overwhelmingly positive in each of these towns. These three events are the first of hundreds to follow. Follow the lead of these Not In Our Town communities and bring Waking in Oak Creek to your town. Click here to request the DVD and discussion guides. Milwaukee’s FOX6 covered the March premiere. Cameras from the Central Illinois NewsCenter joined our community event on March 25. Watch the coverage here. WGLT’s Mike McCurdy also sat down with Not In Our Town executive producer Patrice O’Neill for a 20-minute segment that features real issues in Bloomington. 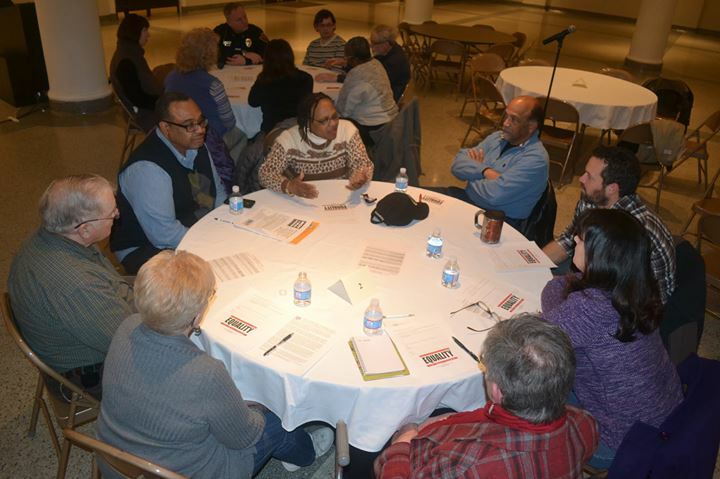 A radio series, “In Their Own Words,” that launched in February has already served as a “lightning rod for tension” and callers have accused a local educator and the radio station of promoting “propaganda to demean white people and agitate unrest among the black people.” For retired educator Camille Taylor, this has been a teachable moment for Bloomington-Normal. Listen to the WGLT segment here. In addition to O’Neill, the conversation was joined by Joseph Cichacki of the St. Louis Metropolitan Police Department. Listen to the interview here. Bring Waking in Oak Creek to your town. Join libraries, community and faith groups, and classrooms that are already screening and discussing the film. Click here to request a DVD and discussion guide. This film is being released as part of the Safe, Inclusive Communities Initiative, a collaboration between Not In Our Town and the U.S. Department of Justice COPS Office. Learn more here.